To mark my tenth year in business, I'm offering 10% off all cakes supplied in October. Spaces are limited and available on a first-come-first-served basis. A big thank you to all my past and present customers for choosing me to supply a cake for your special occasion. Congratulations to all the above winners. Congratulations go the following customers who won a prize in the Petescakes 2012 Prize Draw. The winning tickets were drawn by Mrs Gillian Pejic. 1st prize, an 8" iced and decorated Christmas cake, was won by Mrs Nicola Jackson with ticket No 624. 2nd prize, a 6" iced and decorated Christmas cake, was won by Mrs Hannah Lowe with Ticket No 633. 3rd prize, a pair of 4" iced and decorated Christmas cakes, was won by Mrs Jane Patrick with Ticket No 571. Congratulations go to Claire Snell who won the 8 inch iced and decorated Christmas cake in this years FREE prize draw with ticket number 406 which was drawn by Mr S J Rotchell. Claire will be collecting her cake later this week. May I also take this opportunity to thank everyone for their custom and to wish customers old and new a very Merry Christmas and a Happy New Year. 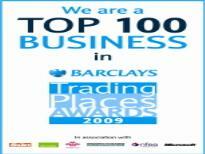 In April this year, after again being persuaded to enter for this years event, I was lucky enough to win a place in the top 100 in Barclays Trading Places Awards 2009. Backed by the Government, the awards acknowledge those who have overcome hurdles to start a business, and have turned their lives around for themselves and their families. Petescakes Top 8 business in the Western region! 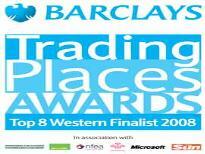 In June 2008, I was encouraged by The Job Centre Plus to apply for the Barclays Trading Places Award 2008. Pete's Cakes was selected as one of the Top Eight Businesses in the Western Region and my wife and I attended the awards ceremony on the 8th July at the Chateau Impney Hotel, in Droitwich Spa, Worcestershire, where I received the certificate from Neil Butler, Barclay's Regional Director for Western and Wales. This was followed up by an interview with Dan Tierney on the 'Pete Morgan Breakfast Show' on Radio Stoke on 13th August 2008 and a feature in the 'College Live' magazine (Issue 43: Summer 2008) produced by Stoke-on-Trent College. Pete awarded by the Learning and Skills Council! 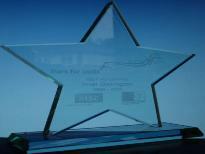 On the 12th March 2008, after being nominated by Business Initiative, I was lucky enough to win 'A Learning and Skills Council and European Social Fund, Stars for Skills Achievement Award' in the 'Best Re-Trainer' category. The award was presented by BBC's Ashley Blake at the Molineux Football Stadium, Wolverhampton. This was followed up with a feature about 'Pete's Cakes' in the Evening Sentinel on 9th April 2008. To answer the second question first --- No, I have only been baking and decorating cakes as a hobby since 2002, but I have always been fascinated to see the cakes and decorations that other people create from seemingly nothing more than a few ingredients, some marzipan and some icing.